The Violin Spider is another common name for the Brown Recluse Spider. They are well known for the look and design that features a type of violin drawing. They only have 6 sets of eyes which is interesting considering others have 8 sets of eyes. These Spiders are less than 1 inch long. They come in all shades of brown with a medium coloration being the most common. You will also find those out there that are black, cream, or gray. This is why people are often not sure of what type of Spider they happened to see or not. Their location also affects the type of coloration that they will feature. It is a natural way for them to be able to blend in well with their surrounding area. They need this camouflage to help them be able to successfully hide from predators. They are one of the hairy types of Spiders as well. The stance that the Brown Recluse Spider is able to show very good posture. The legs are also known to be all on the ground all the time. The only time when this won’t happen is when they are in a posture to show assertiveness. This allows them to lift the front legs so that they can show that they aren’t going to back down from the threats. They move along at a slow pace though so if they don’t feel that they have to stand up to a threat they won’t. They may move back slowly though so that they can keep a good set of eyes on potential threats around them. You will find the Brown Recluse Spider out there in many places. They tend to live in areas where humans haven’t disturbed things for a while. This can mean your shed, your attic, and even a storage unit. They may be outdoors in wood piles or behind various items that you have placed out there but not used for quite some time. It isn’t uncommon for people in many areas to discover this type of Spider in their home due to the heat that is generated there. This will be very common during the times when the weather outdoors is going to begin to cool down. Being able to consume a wide selection of food in their natural habitat is encouraging for the Brown Recluse Spider. They don’t have to worry about finding only one time of meal around them. They are mainly going to enjoy fresh kills that get caught up in their webs. When they get the chance to create a web for live catches they will drop down to it as soon as they can. They don’t want to risk the prey breaking through the web and escaping. Some of the items they will catch include crickets and cockroaches. Then venom is injected that they will use to help them reduce the tissue consistency of the body. They have to consume only liquid so they will allow the prey to stay there until it gets to a liquefied consistency. Then they will consume what they can, leaving the shells of their prey behind. However, they aren’t opposed to eating what they find that is already dead out there. There is only a certain period of time when the Brown Recluse Spider will be able to deposit her eggs. This is during the hotter periods of the year – May, June, and July. She may have hundreds of eggs at once time, but she can also hurry and mate twice during that three month span. This is very common so she will have a double batch of eggs per year. Before mating can take place though the females have to give the males permission. They can be very particular when it comes to which one they will mate with. They will watch various activities by the males that are quite interesting. Some of the males will bring food, they will dance too. These movements can be entertaining with a variety of jumps and spins involved. Even with him giving his best effort though it may not be enough. Researchers aren’t sure why she will still choose to turn some of them away. About two months after successful mating does occur though they young will arrive. Even though there are a high number of them very few will survive more than a couple of days. Only a small percentage of them will reach the age of 1 year when they will become mature. Many humans don’t care for Spiders at all due to their appearance and their bite. 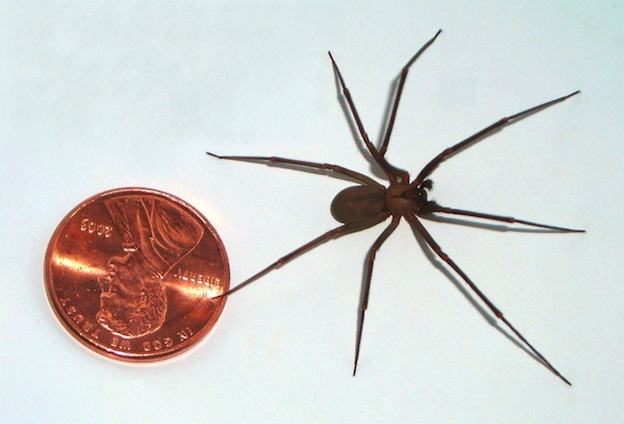 The Brown Recluse Spider has been known to bite humans when they do feel threatened. Yet they aren’t aggressively out there looking for people to inject their venom into. When people leave items out that these Spiders use for habitat it can be a disaster waiting to happen. There are usually very few instances though reported of humans being bit by this particular type of Spider. Most of the time it has to do with a person putting on an article of clothing or a shoe. The Spider is in there and then they suddenly feel pressure from the person’s body. This is what causes them to panic and to bite. It is a good idea to check clothing you don’t wear often before you put it on. You never know if there are such Spiders lurking. A quick check is all it takes to save you the agony of bite. However, for most people the bite is nothing serious. They don’t even realize what happened. There are a few people though that have had some serious allergic reactions. The area swelled up, they broke out, and they had to seek medical treatment. If you do know that you have been bitten by a Brown Recluse Spider you want to wash the area well. This will allow you to reduce the infected area from spreading on the outer part of the skin. Keep a close eye on the flush to see if it turns red or discolored. If such symptoms appear you need to immediately get to a doctor. The flesh may start to decompose inside if you have a serious allergic reaction to this particular Spider. There is a type antihistamine that can help to reduce breathing problems due to swelling. The sooner they are offered the faster a person can start to recover. Antibiotics as well as pain medications are likely to be given. Some people have allowed the destruction of red blood cells to continue for so long though that they suffer long term damage. The problems can cause the kidneys to shut down and it can also lead to the body going into a coma. Only in very rare cases has someone died from it. If you aren’t sure then you should seek treatment to be safe. This is also a good idea if you live quite a ways from the hospital. You should take the Spider with you if you are able. That will allow for positive identification to be made. If that isn’t possible though medical staff can take actions to help prevent serious problems from developing as a precaution.